Although reading this book (even the short versions) aloud to your children builds much better memories than watching a video or listening to an audio book, it is not surprising that many worthwhile adaptions of A Christmas Carol have been made. In fact the book has been translated into stage and screen well over fifty times, if you count parodies such as Bill Murray's Scrooged (which is not on my "a-list"). Most authentic modern versions - The George C. Scott and Patrick Stewart versions. When the George C. Scott version was released, a related book that described many Victorian Christmas customs was published as a companion to the movie. Though it is out of print, this book is worth having for any serious fan of the story or of Victorian Christmases in general. Check out A Christmas Carol Christmas Book by Tim Hallinan, Amazon # B000B5S88A. Best children's version - The Muppet Christmas Carol . Michael Caine plays a believable Scrooge surrounded by a supporting cast of fuzzy characters. The plot is surprisingly close to the book, making this a good introduction to the story, and the sound track has some very nice songs. Best retelling - The made-for-television special An American Christmas Carol , stars Henry Winkler as a Depression-era miser whose experiences largely parallel Scrooge's. Don't laugh, this is the most emotionally moving of all the adaptations. It's a Wonderful Life , starring James Stewart, is a classic in its own right. One Magic Christmas , starring Mary Steenburgen, is the story of a modern housewife whose "Christmas spirit" disappears when it suddenly looks as though the family will lose everything they have worked for. The scenario is all too real, the characters are believable, the story is "character driven," and the acting is supurb. Harry Dean Stanton as a harmonica-playing, quiet-voiced angel makes even the supernatural element palatable and integral to the film. The Family Man , starring Nicholas Cage, deserves honorable mention in this category as well. It's the story of a financially successful bachelor who is forced by a supernatural twist to see what (and who) he gave up to achieve that success. Shelia likes it because the personal interaction of the principals is believable (under the circumstances), and parts are charming in what I would call a "chick-flicky" way. But, although the action happens around Christmas, it's not really about Christmas per se, as the other movies on this page are..
Mickey's Christmas Carol - This is one of two Disney specials that are worth sitting down and watching with your kids (The other one is Small One). Mickey's Christmas Carol was a hallmark, the first time in over 50 years that most of the crew had been animated by hand-drawn animation. There is a story that each of the lead Disney animators were vying for the chance to animate Mickey or some other great character, so someone wrote the character's names on slips of paper, then threw them all in the air at the same time, and the animators scrambled for the slips of paper. Imagine what a privilege - and responsibility - it would be to be the first person to animate Mickey (or even Goofy) in half a century. This is also a reasonably close and very respectful adaptation of Dickens' original Christmas Carol. Scrooge McDuck, a longtime Disney character (seen mostly in Disney comic books) is, quite naturally, the geezer. Goofy is Marley, Mickey is Bob Cratchit, and so on, but, with the exception of certain liberties (such as Goofy/Marley's clumsiness), the Disney characters do justice to their Dickens counterparts. This movie is currently available as part of a Disney compilation that also includes Small One. But don't be fooled into handing the dvd to the kids and telling them to watch all three shows on the disk back to back without you in the room. This show and Small One, are worth making the time to watch with your family. Kelsey Grammer, long the grumpy communicator of television show fame, takes on the role of the ultimate grump, in a faithful, if not totally inspired adaptation. Yes, I'll be honest, the Patrick Stewart and the Muppet/Michael Caine products both outshine this one in their own way, but neither of them is currently available for instant download. So if you're snowed in, have high-speed internet, and want to watch A Christmas Carol, and be reminded of Dickens' original characters and message, this is a good way to go. On the other hand, if you are a Kelsey Grammer fan and want to order the DVD, click here to see that option. Other Resources: For a far more comprehensive list of movies based on (or in some cases lampooning) A Christmas Carol, refer to Tom Howe's CED VideoDisc No. 26 page. Tom's site features movies that were released in an unusual (now obsolete) format, but on this page he got carried away. 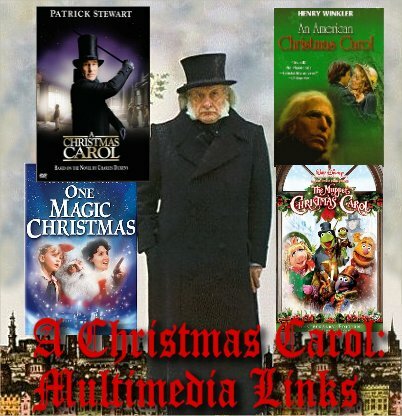 In addition to describing the Christmas Carol adaptations that were released in CED format, Tom goes on to list every Christmas Carol movie he could find information about. Some of them have reviews and descriptions as well. To return to the Dickens Christmas Carol Home Page, click here. To return to the Family Christmas Movies Home Page, click here. To return to the Family Christmas Online? Home Page, click here. Note: Family Christmas Online? is a trademark of Breakthrough Communications(tm) (www.btcomm.com).